Romeo by Romeo y Julieta | Chicago's Pipe, Cigar & Tobacco Store | Iwan Ries & Co.
As one of the premium cigar world’s best-known and most highly trusted brands, Romeo y Julieta has always been revered for its consistently excellent, mild smokes. 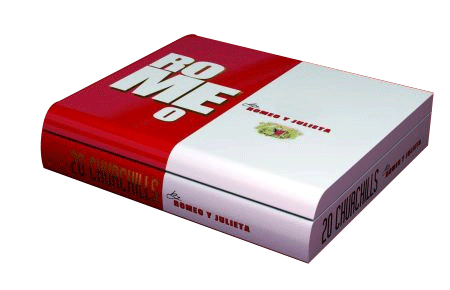 Now, Romeo brings new excitement to the contemporary aficionado with this line of modern, fuller-bodied cigars. Traditional non-Cuban Romeo y Julietas are made with Indonesian wrappers and have a mild flavor profile. The new Romeo by Romeo y Julieta cigars are crafted with dark, Ecuadoran Habano-seed wrappers around an all-Dominican blend. Robust, full-bodied and rich in complex flavor nuances, Romeo is meticulously crafted at the famed Tabacalera de Garcia in the Dominican Republic by the skilled hands of the factory’s most accomplished artisans, each with decades of expertise, chosen specifically to create this uncommon cigar. Now Available In Store Only.